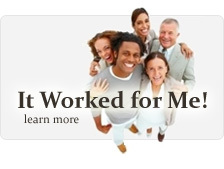 Eliminate the appearance of scars and promotes healthy skin tone. 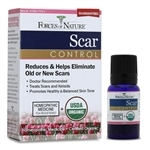 Eliminate the appearance of scars and promotes healthy skin tone. Value Size. Scar Control is a quite unique new product which is unrivaled in its efficiency in scar removal. It combines potent homeopathic ingredients to dissolve scar tissue and a complex blend of botanical essences to nourish and rejuvenate the skin. This powerful blend of plant essences is effective on keloid, scar and also stretch marks removal. Gentle enough to use on even the most sensitive of facial skins, it is a wonderful acne scar removal treatment too. Applied daily, this lustrous treatment absorbs right through to the base of the skin to improve its overall condition. By a process of osmosis it is taken through to the granular layer where the production of new cell growth takes place. It treats the skin from the surface down. Dissolving damaged and hard tissue it also helps to reduce discoloration. In just a few short weeks the difference in the appearance and feel of its surface are clearly noticeable. Gradually tissue is softened and a more regular skin tone is achieved. Little by little scarring reduces and begins to fade away. Way below the surface a different, more important set of actions is taking place. Vitamin rich nutrients are feeding new cells to encourage stronger, healthier skin regrowth. Calendula Officinalis, the primary ingredient in the treatment has been used for centuries for its skin healing abilities. More recently clinical trials have shown it to be remarkable in treatment for post radiation burns and scarring in women being treated for breast cancer. Taking the heat and soreness out of new injuries it allows fast effective healing to take place. An important medicine for any kind of damaged skin, it is unrivaled by any other ingredient in its ability to regenerate skin tissues. Also contained within the blend are many extracts all chosen for their nourishing capabilities. Enjoying the benefits of Scar Control's richness of triple unsaturated fatty acids and ketones, skin regrowth is stronger, softer and healthier. The new grown cells are translucent and youthful. Scars are more supple, lose their hardness and dryness, as gradually the skin begins to improve. Within days patients report very clear, visible signs of improvement in their skin tone and quality. The ingredients in this preparation are the purest you will find. Botanicals are shipped from the certified organic producer in the French Alps directly to our facility. This extra care is vital to ensure its purity. 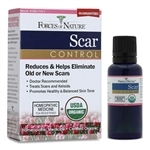 In recognition of this, the FDA made Forces of Nature Scar Control their very first scar removal medicine to be certified organic. Also recognized by the USDA, Scar Control is unrivaled in certification but more importantly....its results. It is so simple to use, why not try it for yourself? Unlike most other skin removal treatments available on the market, Scar Control comes with a 1 year money back guarantee.